And why would you try to separate the xylenes? The boiling points of the three isomers are separated by just 6°C so distillation is not an option unless you carry a lot of plates. Lusi & Barbour venture ahead anyway (DOI) and draw inspiration from an 50 year article on xylene separation by clathration (DOI). Key is a so-called Werner complex based on octahedral nickel with 4 phenylpyridine and two isothiocyanate ligands. This compound forms an host-guest compound with each of the xylenes and what matters to Lusi & Barbour is how selective this process is. When a xylene vapor is exposed to the nickel compound, the ortho isomer gets caught first (o/m=34.2, o/p=40.5). With this isomer out of the way meta is then preferred over para (m/p= 12.7). Interestingly the trend in thermal stability and sorption kinetics for the isolated compounds display the opposite trend. With respect to guest-accessible volume the trend is meta < para < ortho. The next quote is noteworthy: in the selectivity trends in terms of packing interactions, any such evaluation would be merely speculative; we recognize that many subtle factors may influence selectivity and that any simplistic approach based on comparing densities, interactions, and so on would be inadequate in providing a holistic explanation for the observed trend in guest preferences. And why again would you try to separate the xylenes? Pure meta-xylene is used as an anti-knocking agent in gasoline. Big business assured. Amides are important in organic chemistry but their synthesis involves more than a simple reaction between a carboxylic acid and an amine due to the unfavourable chemical equilibrium. In a variation called the Schotten-Baumann reaction the acid is activated as an acid chloride. You will not find esters in any list of amide precursors but a report by Ohshima et al. suggests esters and amines can react directly although with an unlikely catalyst: sodium methoxide ( DOI). Ronald Breslow has been taking some flack from the bloggosphere (here,here,here) not to mention twitter, for him mentioning dinosaurs in his JACS article on homochirality (DOI). Apparently dinosaurs sell. According to Breslow somewhere in the universe a planet exists inhabited by a life form with reversed stereochemistry but Breslow should have written that it could well be an advanced breed of grumpy bloggists and not dino's. A more serious offence according to the twitter mob is that Breslow in 2010 published a very similar article in Tetrahedron Letters but since we are boycotting Elsevier publications in this blog we are going to be lenient on this one. Never mind the dinosaurs or self-plagiarism, what point is Breslow trying to make? Here is the quick summary. Starting point is the well-known Murchison meteorite which famously contains a collection of 5 alpha methyl amino acids enriched in the S enantiomer. Interstellar space has all the building blocks to make amino acids (ammonia, ketones, acetylenes etc.) and when concentrated on a meteorite the Strecker reaction could do the trick. Enantiomeric enrichment then could result from selective destruction of one enantiomer by circularly polarized light. The astronomers still argue what type of star could generate this type of radiation (neutron star? dwarf?) and with what energy. In phase two, having arrived on planet earth the amino acid passengers disembark the meteorite and start an ambitious program of chirality transfer (make new chiral molecules) and chiral amplification (increasing enantiomeric excess). With respect to the first objective Breslow explains his group has already demonstrated it is possible to remove the methyl group from an amino acid with some preservation of chirality by simply exposing it to an alpha keto-acid with a copper salt as catalyst. 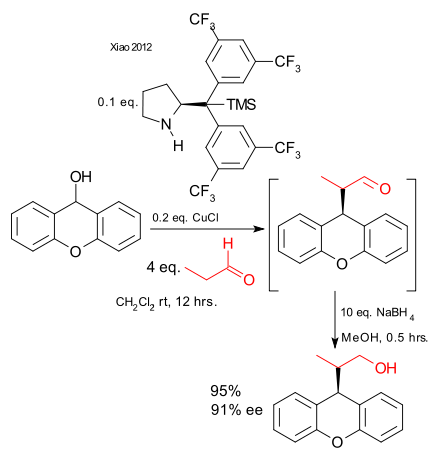 D-sugars such as ribose can be synthesised from formaldehyde in the Formose reaction and an intermediate step to glyceraldehyde catalysed by chiral amino acids is enantioselective. With respect to amplification Breslow mentions that when amino acid solutions containing a small excess of one enantiomer are concentrated, racemic crystals form more easily than homochiral crystals and are thus removed from the system. Same story with glyceraldehyde where the racemic crystalline form has poor water solubility. Ribose on its own does not do this trick but when combined with a purine to a uridine (en route to RNA) again the racemic crystals stand out. Is this a solid theory for the origin of homochirality? No, Breslow is quick to point out the theory is plausible at best but the hunt is on for the remaining missing links. Szostak, Spain & Proctor have seriously investigated (11 JORG pages!) several procedures for the synthesis of samarium iodide, an important reagent in organic chemistry (DOI). A traditional method is reaction of 2-fold excess samarium metal with diiodoethane or iodine in THF with stringent exclusion of water and air in a Schlenk line. Prepare for some convictions smashed. The onset of a blue colour is not really indicative of the completion of the reaction: it is not possible to distinguish a 0.005 from a 0.1 molar solution. The presence of water does not affect the overall yield of the reaction although it correlates with the induction time ranging from 10 minutes to up to 2 hours during which water eats away at the samarium metal. This is a time-saver for the front-line bench chemist. As surprise number two, against all conventional lore the reaction does not even suffer from the presence of oxygen. So get rid of that Schlenk line and quit degassing all the time! The only precaution that still makes sense is excluding oxygen from the finished product in storage because Sm(II) is easily oxidized to Sm(III). Ditto the peroxide content of THF was found to be irrelevant. And then there is unusual case of the inactive batches of samarium metal that have plagued chemists for the past 30 years. Typically attributed to the formation of an oxide layer Szostak, Spain & Proctor did not find the corresponding evidence. The true explanation remains shrouded in mystery but at least an inactive batch can now be identified by measurement of its density. Again in the true spirit of alchemy an inactive batch can be activated by dry-rolling samarium in an inert atmosphere followed by oxidation with iodine but not with diiodoethane. Equally intriguing: the shelf-live of SmI2 derived from iodine is much shorter than that derived from diiodoethane.